A man walking his wife around on a dog leash at an annual Pennsylvania fair was arrested and charged with simple assault. Police in West Manheim Township charged 66-year-old Walter W. Wolford, of Hagerstown, Pennsylvania, with simple assault after he was reportedly seen leading his wife around on a dog leash at the annual York Fair. Police said Wolford “had his wife, Catherine, attached to an 8-inch, long red nylon dog leash and yanked the leash, causing her head to jerk back, resulting in red marks around her throat,” according to pennlive.com. “But Wolford said he only gently tugged on the leash, which he told investigators he used to keep his wife, who suffers from late-stage dementia, from getting lost, according to police,” the news agency reported. The York Fair, billed as “America’s First Fair” and running for more than 250 years, is held every September, the Friday after Labor Day. 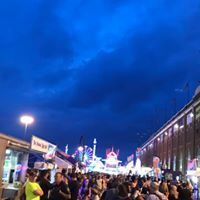 Police officer Bradley J. Cleck said in charging documents that he was called to the York Fair to investigate the incident and that he saw red marks on the woman’s throat. He said he tried to speak with her, and she did not know her name or where she was. “Walter Wolford, who was agitated and repeatedly said he was embarrassed about the situation, told the officer when the couple visited the fair last year, she had wandered away and was lost for 90 minutes. He came up with the idea of using a leash to prevent that from happening again,” pennlive.com reported. Wolford reportedly told police that he only “gently” tugged on the leash when she tried to walk away in an effort to make her stop. The first York Fair was held in 1765, more than a decade before America was founded.